Trust our dedicated party planners to arrange an unforgettable murder mystery dinner in a perfect setting for you in Leeds. If you’re arranging your next big staff event, looking for an unusual hen party idea, or planning that important birthday party, you’ve come to the right place. Our murder mystery games offer a unique event experience that can be enjoyed by friends, families and colleagues. Our murder mystery Leeds dinners offer you and your guests the chance to relax and enjoy something a little different for your next big party. Lead by our exclusive scripts and fun activities, we put a modern spin on the classic who dunnit that promises plenty of laughs and moments to remember. We don’t use actors, so each person in your party will have their very own character to play in the deadly tale. Act out the parts, play the games and win the challenges in order to catch the criminal among you! 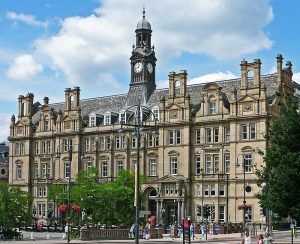 Our behind the scenes event management team can arrange the perfect party for you in one of our specially selected Leeds partner venues. You can expect fine dining and unbeatable customer service while you channel your inner detective and try to win the prize. Our lively and approachable hosts will be there to take you through every step of the murder mystery and ensure all of your needs are catered for. We take great pride in creating unforgettable murder mystery dinners and events. Once you tell us the occasion and the date, we can take care of the rest. Looking for the perfect hen party pad? Take a look at Norfolk house. "The fun atmosphere that was created meant that the most unlikely people turned out to be fantastic actors and everyone joined in. The preparation of scripts and activities was professionally done. Most of all though we had so much fun. Thank you." 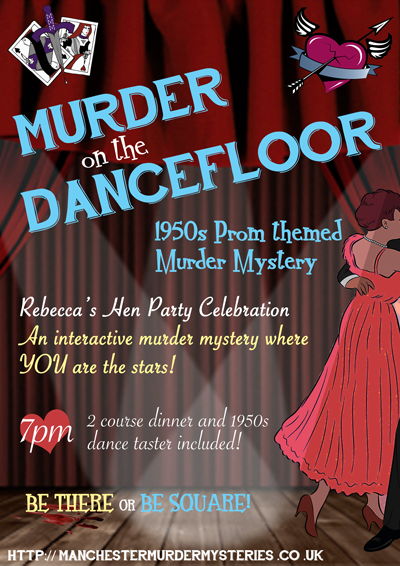 …our ‘Murder on the Dancefloor‘ 1950s theme for your party!